Here we go again. 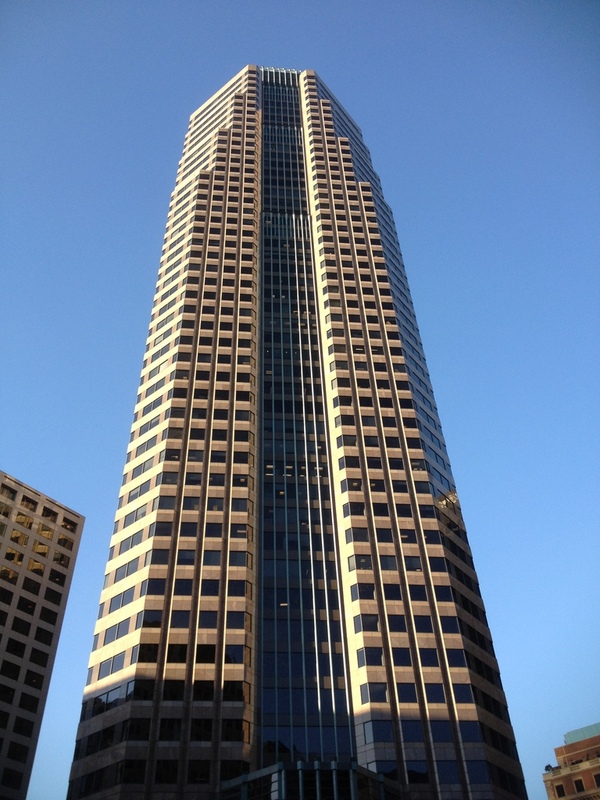 This evening was the first of six practice climbs up the Figueroa at Wilshire building in downtown Los Angeles. This is in preparation for the Cystic Fibrosis Foundation’s stair climb in December. I came in with two goals for this evening. The first was to practice my pace that I intend to use for the Sears Willis Tower climb in two weeks. The second was to do a survey climb to take notes and make a chart of the staircase. As usual, I took the train downtown. The 7th St/Metro Center station is right across from the building, so you can’t beat the convenience. I’d made up a little card with split times to pin on my glove. As I did at the U.S. Bank Tower climb, I just wrote down the floor numbers where I intended to be at the 2, 4, 6, and 8 minute marks. Because I didn’t have a chart of the staircase yet, I had to do a bit of guesswork there. But it turned out that my guesses were pretty close to the mark. I started out first, since I didn’t think anyone there was going to be going much faster. Lisa started right behind me, and she ended up passing me at about the 30th floor or so. 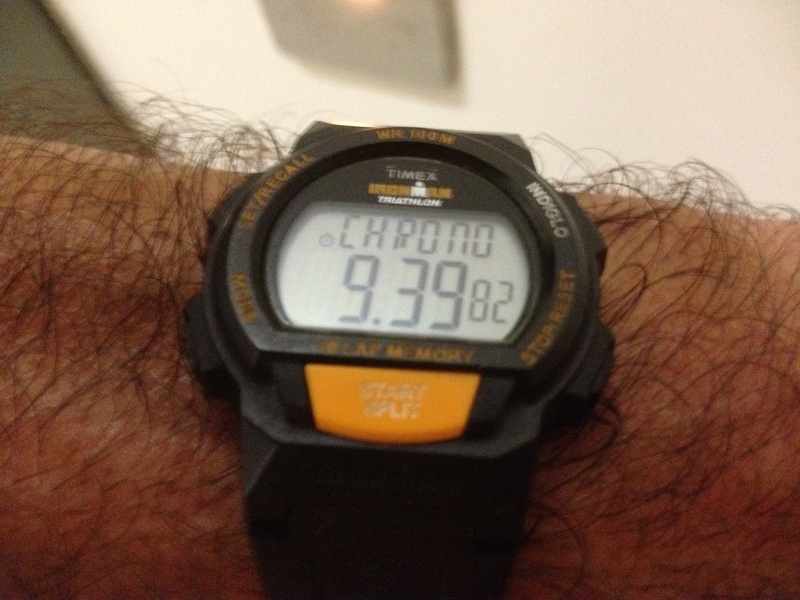 At the two-minute mark, I was 10 seconds ahead of schedule, so I slowed down a bit. I’m trying to just internalize how it feels to go at a pace of 11.6 seconds per floor. That pace feels quite modest to me now, and I think I can maintain that for 100 floors. At the end, I did do a little sprint to the finish, starting at 47, and breaking into a run at 49. The finish line for the race is on 51, and Lisa and I came out in the janitor’s closet up there. 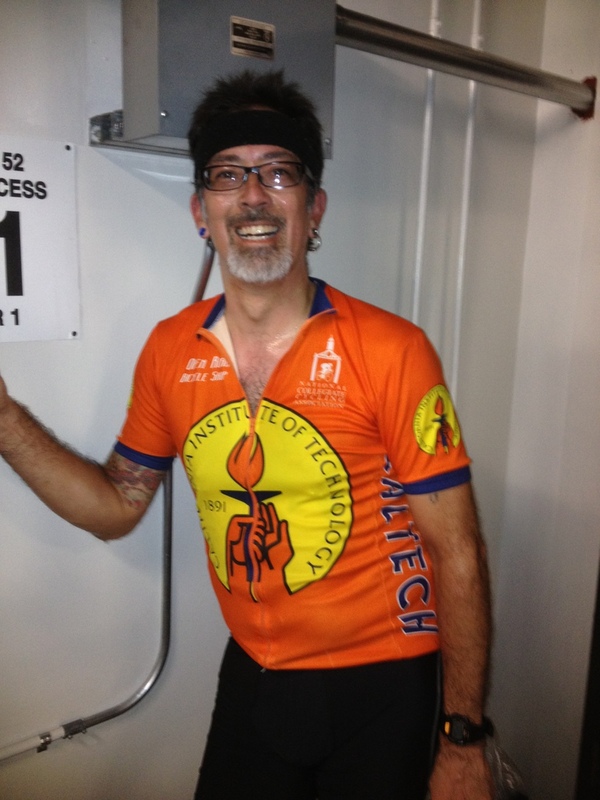 We looked around a bit to remember where the freight elevator was, and then we rode back down to the lobby. The guard in the lobby told us that he’d been told we weren’t going to be using the elevator to come down. We explained to him that we were just doing what we’d done the last two years, and besides, I have a policy that I’m not walking down the stairs unless the building is on fire. And I forgot to bring matches along tonight. So we talked to Rebecca from CFF in the lobby and she said she would talk to the building manager about it. I got my notepad and pen, and Lisa and I headed back up for a second time. The staircase if pretty much standard-issue for a newer building. The steps are 7 inches, stamped steel. The two floors from 4 to 6 are odd, with each being a set of two 13-step flights. That’s a problem, since 13 is a weird number, and it messes up my stepping pattern. But after that, it settles into a nice 12/11 pattern. This is just like the 777 Tower, and I worked out a good way to do that. There is a left turn and very short hallway at 21, and then it reverses. Still right-hand turns, but the stairs switch to an 11/12 pattern. This is good, since I can still use the same stepping pattern. That pattern stays consistent all the way up to 49, where there is a big landing and the little place I call ‘the petting zoo‘. At that point, it’s two more floors, and they’re both bigger than normal, so they’re the equivalent of a bit more than three regular floors. At 51, I continued on up, just to take notes on the rest of the staircase, even though it’s not going to be used in the race. I just figured I’d take it in for the sake of completeness. So it turns out that this building is nearly a copy of the 777 Tower staircase. It’s 1,181 steps for the race from 1 to 51, and 689 vertical feet. Compare that to the practice climbs at 777, which were 1,139 steps and 664 feet. And this climb is almost exactly half the climb at Sears Willis. I thought for sure you would blog about the last minute stair climb practice cancellation last Wednesday but then thought why bother. Hope to see you next week.